If you want to Belt, the chances are that you have heard of this term ‘mixed voice’ (or mix voice as it is also called). For many singers just trying to work out how to tap into your chest and head voice can prove challenging enough so when you are told to ‘blend the two together’ is can bring on a whole world of confusion. I hear you my friend and don’t worry cause I’ve got your back. 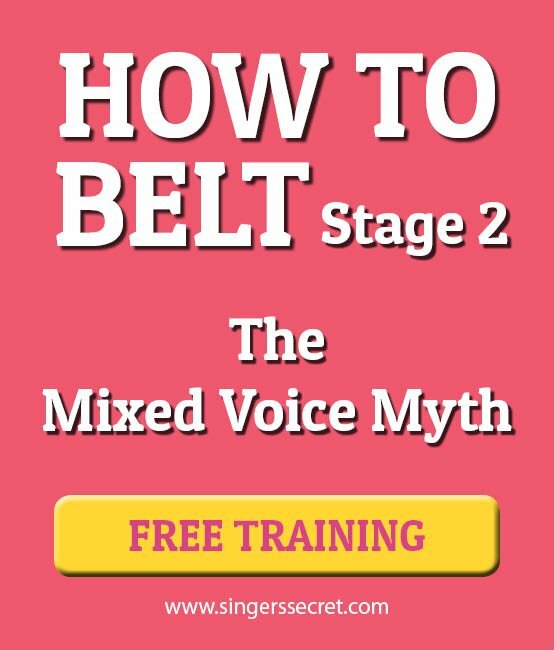 In this video I’ll explain why the whole concept of the ‘mixed voice’ is unnecessary and I’ll show you how to access Belt notes without ever having to worry about which ‘voice’ you are using. PS: This is video 2 of my ‘How To Belt If You’re Not A Natural Belter’ series and you will need to watch video 1 first in order for this video to make sense. You can watch the first video here. Mixed voice? What the heck is a mixed voice? If you want to belt, you’ve probably heard of this term ‘mixed voice’. I really don’t like when people talk about the mixed voice because in this singer’s opinion it’s a total crock and the reason is because when you’re using your chest voice you can feel that you’re using it, when you sing in your head voice, you can feel that switch when you move up into your higher notes. And for most singers getting rid of the break in-between the two and smoothing this out can be a real challenge so when you start hearing terms like mixed voice being thrown around (which some singing teachers call a combination of chest and head voice) it can add a whole other level of confusion. So if you’re struggling with the concept of mixed voice, I’ve got a new approach for you. Think of it like this: you have one voice. Clearly you don’t have all these separate little voices. What all this stuff ‘head voice, chest voice, belt voice’, mixed voice is actually referring to is where you are resonating your sound in your head or more specifically on your face. In my first video about belting I go into detail about this – so if you’re watching this video and you haven’t seen that one yet, pause this and go watch that first (I’ll put a link in the description) because otherwise this video isn’t going to make as much sense to you. So if you have watched that first video then you know how the combination of air pressure and resonance is what you need to get a healthy belt and you would have done the exercise to practice moving the resonance around your head and opening and closing your throat to control your air pressure. Now in this video I’m going to show you how to release the pressure in your throat and make this process of sliding through your registers so much easier. Step 1: You need to raise your soft palate. Your soft palate is right at the back of your mouth and its surrounded by muscular fibres which you can learn to stretch in order to raise your soft palate. Having this raised is going to help you to laser focus your sound on your face because it acts like the roof of a cathedral: not only will it help you to achieve a more resonant sound but it will also help you harder air pressure as you resonate higher: which is what we want for our belt. The best way to approach this is to yawn. Feel the stretch at the back of your mouth. Then keep that yawn and start doing vocal slides: get yourself used to the stretch. Now we’re going to move that resonance forward because like I said in the first video, your belt lives just under your eyes on your cheeks. Sticking your tongue out is going to automatically move your sound forward but in order for you to keep your soft palate up you’re going to have to work a bit harder. Now here’s the trick with this one, you want to do a posh sounding Aaah not a wide Aaa. This will keep the sound long – which is what you want, because if you go to wide your resonance will be squashed and you won’t be able to move your sound up in your face. Having the tongue out will also help to keep your throat relaxed. If you find that you’re tightening up in the throat, go back to yawning to get that super relaxed, open throat, raised soft palate feeling and work back through these steps slowly. – Take your time with these and really start to become aware of what your muscles are doing. Then once you’ve got that feeling going change the sound to an e. Go for a nice sounding e not a squashy e.
Now – this is where our nasal sounding singers get blocked. Not all of you, but if you tend to resonate too much in your nose this will make you sound really nasal. So if that’s you, and this is a good tip even if you don’t sound nasal, open your epiglottis. If you’re thinking what the hell is the epiglottis? First I got to learn about resonance then air pressure then raising my soft palate now you want me to operate my epiglottis? I don’t even know what the hell that is? Well my friend, no one said belting was easy and its for all these reasons that many singers have trouble getting a good belt sound. Some singers do these things naturally but others might be doing all of them except they don’t have enough air pressure, and unless you have all of these steps going on, you’re not going to be able to get a healthy belt. Now this video is going to become marathon very quickly if I explain all this epiglottis stuff, so look out for that in my next video but for now practice doing the exercises in the first video, then do this soft palate exercise in this video and then when you’re singing around the house see if you can combine them together. It takes time, it takes practice I’ve given you the steps to get there so just do a little bit each day and you will improve. Did this video help you? Are you struggling with any of the steps? If you are – please leave me a comment or question below. Thanks for this wonderful video, so clearly explained. I have learned much from these 2 videos. Where is the next/third video?!? Its for this very reason that I don’t teach the mixed voice. Its too difficult a concept for new singers to grasp and hard to explain. I teach other methods. Hey a curiousity, I noticed that in your belting video, but especially when you sing Adele songs, you don’t seem to use a belting like phrasing or tone, but something more soft, although seemingly strong and non airy, more akin to Lana del Rey. You said you are not a natural belter and it’s a very nice singing style even for interpreting belted songs, but isn’t the object her belting with medium resistance, aka a more robust phrasing and the typical twang which gives that ringy belty apparently shouted sound? You´re fantastic!! But where do i find the third video? Let's work on your voice right now! 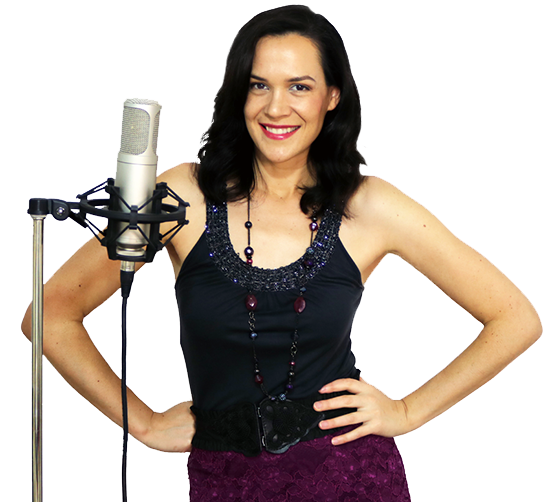 Get started with my 4 FREE jazz vocal warm ups. I'll also send you tips on how to improve your singing. No spam. Just singing lessons.